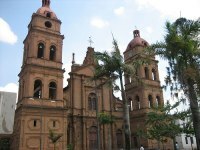 Founded by Spanish conquistador, Nuflo de Chavez in 1561, Santa Cruz is Bolivia's largest city. In contrast with many of the country's cities, it lies a mere 1,365 feet (416m) above sea level and enjoys a tropical feel. Its conditions can be a welcome break from the harshness of the Bolivian Andes. Many travellers visit Santa Cruz as a transit destination, given that planes have an easier time landing at Santa Cruz than navigating the mountains around La Paz. That said, Santa Cruz is a fascinating travel destination in its own right, and worth at least a day or two of exploration. Strolling through town is a great way to take in the beautiful colonial architecture. Tourists can enjoy the many shops and restaurants, or join locals in the Plaza 24 de Septiembre, where people gather to play chess, feed the pigeons, or sip wine at outdoor cafes. Santa Cruz is also known as the fashion capital of Bolivia, and locally made clothing is a popular souvenir. The city's cosmopolitan ambience extends to discos, museums and art galleries. Santa Cruz's comfort and convenience make it an ideal base from which to explore some of Bolivia's most popular attractions. These include Park Amboro, and the historical Jesuit missions. There are also daily flights to La Paz, and buses to many other destinations. We are looking for contributors for our Santa Cruz De La Sierra travel guide. If you are a local, a regular traveller to Santa Cruz De La Sierra or a travel professional with time to contribute and answer occasional forum questions, please contact us.